The South Thompson River is the southern branch of the Thompson River, the largest tributary of the Fraser River, in the Canadian province of British Columbia. 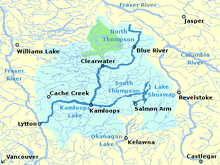 It originates at the outlet of Little Shuswap Lake at the town of Chase and flows approximately 58 kilometres (36 mi) southwest and west through a wide valley to Kamloops where it joins the North Thompson River to form the main stem Thompson River. Highway 1, the Trans-Canada Highway, and the mainline of the Canadian Pacific Railway parallel the river. Little Shuswap Lake is fed by the Little River, which drains Shuswap Lake, which is fed by several rivers and creeks. Before 1982 the river was considered to start at the outlet of Shuswap Lake rather than Little Shuswap Lake, but the short river between Shuswap Lake and Little Shuswap Lake was officially renamed Little River in keeping with long-established local usage. The South Thompson's main tributaries are Chase Creek, which joins from the south at Chase, Niskonlith Creek, which joins from the north near Niskonlith Lake Provincial Park, Monte Creek, which joins from the south at Monte Creek, and Campbell Creek, which joins from the south. ^ "Thompson River". BC Geographical Names. ^ a b c "South Thompson River". BC Geographical Names. ^ a b c "South Thompson River Watershed Management Study" (PDF). Northwest Hydraulic Consultants and Urban Systems. Retrieved 22 August 2013.